The volume of the one sh? masu box is roughly the same as the volume of a 2L PET bottle. It is recommended for serving cooked rice, salad and other foodstuffs to guests, for a cooler vessel for sake , champagne or other beverages that could be filled with ice, or it could be used as a measuring box like in the old times. Although this is the biggest sized masu we have, we offer you traditional Japanese wooden sake cups alias masu cups in a whole range of sizes. 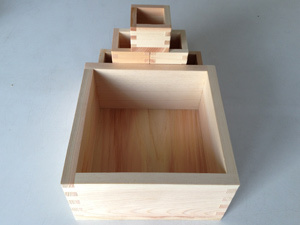 The Extra-large masu is the biggest of all the masu boxes. We have set the smallest and the biggest masu cups side by side. We offer you a wide range of masu cups. Starting from the left:mini masu (3shaku), Small masu, Medium masu, Standard masu,Large Masu, 1 shaku masu. 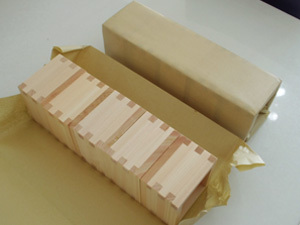 3 pieces of Mini masu in one row could fit into one piece of Extra-large masu. Futhermore 2 pieces of Small masu could fit into a Extra-large masu in one raw. It looks pretty amazing if you try it just like we did on the above small animation. 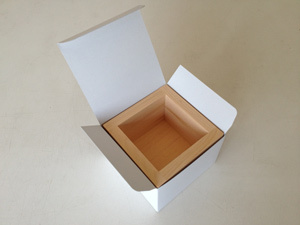 A simple, nice paper box for protecting the masu cups from scratches. It's also very useful if you would like to use the masu cups as a gift to someone. Order a transparent, stringed plastic bag for each of your freshly purchased masu cups. These bags are perfect for people who would like to take their masu cups home they have used them. 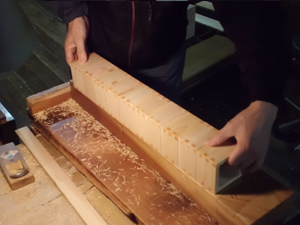 The lumber that’s used for manufacturing masu cups undergoes a process of natural drying either indoors for a maximum of 4 months or outdoors for maximum of 1 month depending on both the quality, condition of the hinoki wood and the weather of the actual season as well. 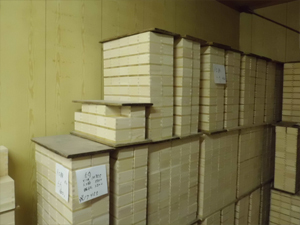 The goal of the drying the hinoki is to decrease the moisture content of the wood to a level that is appropriate for the manufacturing process. The gist of the process is to create a stack of the lumber on raised foundations and dry it gradually with a continuous flow of air. 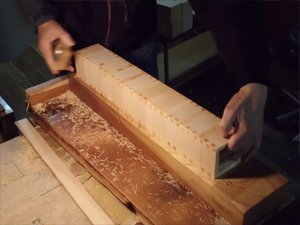 The loss of moisture inevitably causes the shrinkage of the hinoki wood, so it needs to be controlled with care as too rapid drying may lead to damaging the wood. 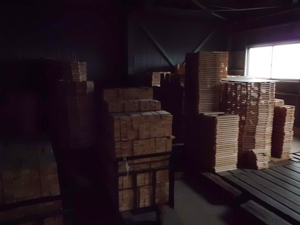 If the lumber is considered dried, then it’s ready for manufacturing. 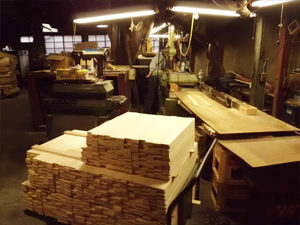 In this step, the lumber is cut into pieces of uniform size and shape by a machine that also shaves both sides of the lumber thoroughly. 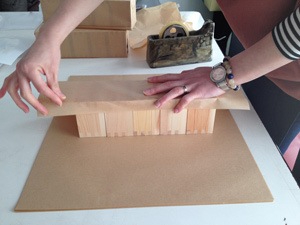 Each and every piece is checked for any faults like wood knots, deformations etc. and these faulty pieces are removed before sending them to the next manufacturing phase. Hinoki (Japanese Cypress) is a relatively expensive wood. 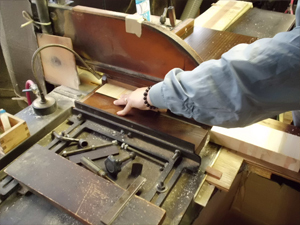 Throughout the whole cutting process craftsman aim to leave as low waste as possible since they would like to offer their products on a low price and they would like to be ecologically conscious too. 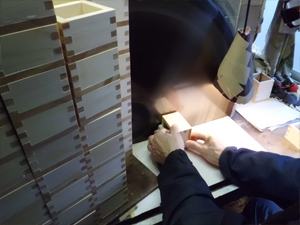 After cutting the parts of the masu cups into the right sizes and shaving them nicely, the joinery work starts, finger tenons are cut into all of them for joining together all four sides of the masu cups. 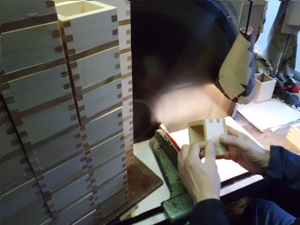 The cutting edge of the tenon cutter machine is polished every day for keeping it as sharp as possible, since this helps to make the quality of the masu cups especially good. 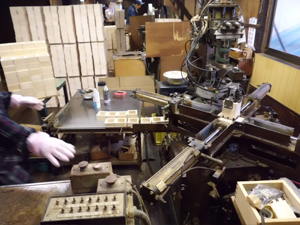 The tenons of the sides of the masu cups are first glued with an adhesive that’s harmless to the human body after dried, and then these side pieces are placed into the frame assembly machine that presses all 4 sides together. Next the frame is checked again visually for any kinds of faults like the assembled frame being too frail, wood knots etc. and these defected pieces are removed from the production. Checking is a vital part of every production step. 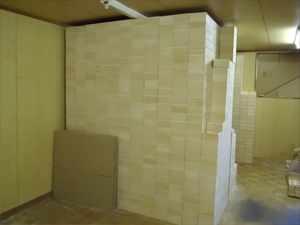 Concerning the safety of the adhesive used in the production, we have 2 safety certifications: one is issued by JFRL “Japan Food Research Laboratories” http://www.jfrl.or.jp/e/ and the other one is issued by JCII “Japan Chemical Innovation and Inspection Institute” http://www.jcii.or.jp/en/ both documents are in Japanese. 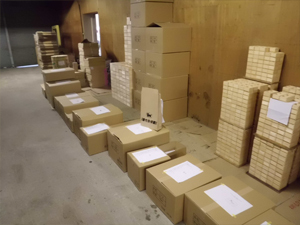 Please contact us if you would like to acquire the English versions of any of these documents. 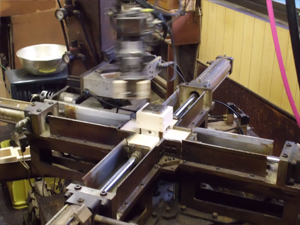 All the surfaces of the assembled frames are leveled using a so-called “planer disk”, the machine displayed above. 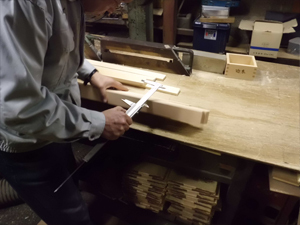 In this step, Japanese craftsmen don’t need to take a look at the masu frames; they know exactly when the surfaces of the frames are perfect by the slight change in the sound of the planing. 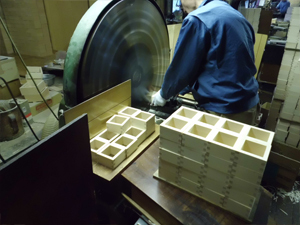 After the frames are planed, the bottom of the cups is glued to the frames to make the masu cups complete. 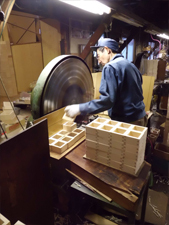 Besides paying attention for the surfaces, the craftsmen take care to produce masu cups of uniform size. 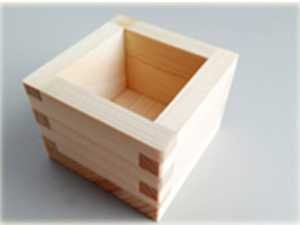 Moreover, after this process every masu cup is checked again for defects like cracks etc. and defected products are removed from the process. In this step the masu cups are briefly put into water so that the joints get a little swollen which makes the gluing hold even better and it gives the masu cups a little gloss as well. 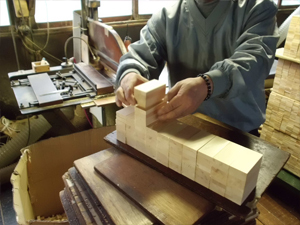 Then all four sides of the masu cups are planed once again equally to make them completely smooth using an even finer "planer disk". The goal of this process is to make the touch of the masu cups even better so anyone who uses these cups can feel good when taking them in hand. 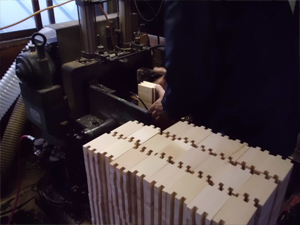 10 pieces of masu cups are processed at once in this step; it’s yet again a good example for the expertise of the craftsmen manufacturing them. Since this is the final manufacturing process, the masu cups undergo a final, very throughout check before they are declared completely finished. 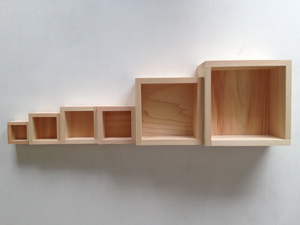 The finished wooden masu cups are stored in a cool dry place until they are shipped. Right before shipping, every 5 piece of masu cups is wrapped in thin brown kraft wrapping paper and they are placed in a cardboard box. 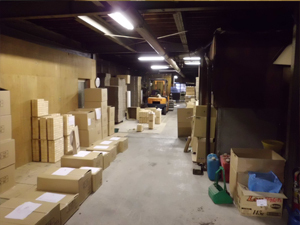 For worldwide shipments the cardboard box is then placed into an even bigger cardboard box with some cushioning materials to protect the masu cups on their way to your country. We sincerely hope that we can deliver the warmth of traditional Japanese wooden masu cups to as many customers around the globe as possible. They don’t come empty; they are filled to the rim with the spirit of all the people who deliver them to you. Please enjoy the unique experience of MASU! This is the most common, standard sized masu cup. From old times, masu cups of this size are used for drinking sake on celebrations in Japan. Japanese unit of go, which is equal to the volume of approximately 0.1804L = 180.4ml. For comparison please note that a usual glass cup in Japan has a volume of about 200ml. which means that its inner volume is 0.09L = 90ml, rougly a mouthful of sake. Perfect for wedding ceremonies and parties of any kind. As its name says, it's a mini sized masu cup. 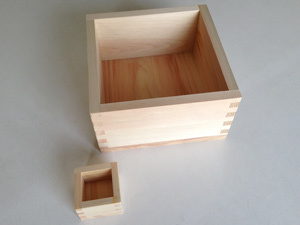 The inner volume of the mini masu is about Mini masu, which is about 0.0036L = 36ml, exactly 2 / 10th the volume of the one go wooden masu box. Its size is also equivalent to that of a regular ochoko cup, which is also traditionally used in Japan for drinking sake, therefore it's perfect for substituting ochoko cups to give you an exclusive sensation. At first sight, the Medium masu cup looks just like a standard size, one go masu. It's inner volume is about 0.143L = 143ml, equal to a half full standard glass cup.